The China-Pakistan Economic Corridor (CPEC) is part development scheme, part strategic gambit. Although Beijing and Islamabad have been close partners for decades, the CPEC is a reflection of intensified and expanded bilateral cooperation at a time of rising Chinese geopolitical ambition and persistent concerns about Pakistan’s security and development. The CPEC is intended to promote connectivity across Pakistan with a network of highways, railways, and pipelines accompanied by energy, industrial, and other infrastructure development projects to address critical energy shortages needed to boost Pakistan’s economic growth. Eventually, the CPEC will also facilitate trade along an overland route that connects China to the Indian Ocean, linking the Chinese city of Kashgar to the Pakistani port of Gwadar. Pakistan and China formalized plans for the CPEC in April 2015, when they signed fifty-one agreements and memoranda of understanding on Chinese investments, totaling $46 billion over the next ten to fifteen years. Some projects are already underway, including highways and energy projects where completion is expected by the end of 2016. CPEC developments are part of a grander Chinese agenda of regional economic connectivity: the One Belt, One Road (OBOR) initiative outlined in March 2015 by China’s National Development and Reform Committee (NDRC). The highly ambitious plan calls for new state-directed investments in roads, railways, pipelines, ports, and information networks to deepen economic integration and connectivity across Asia and into Africa and Europe. Because OBOR consists of a continental Eurasian “Silk Road Economic Belt” and a Southeast Asian “Maritime Silk Road,” Pakistan has the potential to serve as a nexus for the two routes, and Beijing describes the CPEC as a “flagship project.” Although Beijing is quick to downplay geostrategic motivations behind the CPEC, many commentators have noted that over the long run, an overland link across Pakistan to the Arabian Sea could help alleviate the “Malacca dilemma,” China’s vulnerability to the fact that roughly 85 percent(PDF) of its oil imports travel through the single chokepoint of the Strait of Malacca. Understanding the CPEC requires an appreciation for China’s security concerns, especially those stemming from its restive western region of Xinjiang. Beijing has sought to clamp down on Xinjiang’s ethnic Uighur community and has met political violence with an expanded security presence and push for economic development schemes. These efforts implicate Pakistan because Uighur militant groups, like the East Turkestan Islamic Movement(ETIM), have sought refuge in the Pakistan-Afghanistan border areas, where they have established links with al-Qaeda and the Taliban in Afghanistan and Pakistan. China perceives the ETIM as a persistent threat, committed to targeting China and attacking Chinese interests (PDF) inside Pakistan. The CPEC represents an international extension of China’s effort to deliver security through economic development. In this context, the CPEC represents an international extension of China’s effort to deliver security through economic development. Investments in Pakistan are intended to create jobs, reduce antistate sentiment, and generate public resources for additional improvements in law and order. By tackling the threat of jihadi organizations in neighboring Pakistan, China hopes to better secure its own territory. Consequently, while the CPEC is often portrayed as a transportation corridor, security concerns will likely impose limits on the cross-border flow of people and goods, at least in the short to medium term. Pakistan’s ruling civilian and military leaders also appreciate the economic, political, and security opportunities that the CPEC offers. Pakistan needs direct investment to spureconomic growth, but investors have generally shied away over the past decade. If delivered, China’s investment plan represents more than double all foreign direct investment (FDI) in Pakistan since 2008. China’s investments in energy infrastructure are especially welcome. National demand outstrips supply by an average of 4,500 megawatts. Supply shortages and distribution problems lead to frequent blackouts and cost as much as 2 percent GDP growth (PDF) a year. These troubles will worsen as Pakistan’s population of nearly two hundred million expands at a rate of almost 2 percent (PDF) annually. Without the creation of new jobs, however, the nation’s youth (over half of Pakistanis are under the age of twenty-four) will lack productive outlets for their energies. In a state riven by sectarian, ethnic, and political cleavages and populated by networks of extremism and militancy, the need for a growing economy takes on special significance. Politically, Pakistan’s ruling civilian government recognizes that by delivering a range of “early harvest” projects, it will have a better chance of winning national elections slated for 2018. From a security perspective, Pakistan’s military leaders believe that if Chinese investments can turn around the nation’s sagging economic fortunes, they will also strengthen the state against challengers, both foreign (India) and domestic (antistate insurgents). In Pakistan, CPEC projects are being managed primarily by the Ministry of Planning, Reform, and Development in partnership with China’s NDRC. The two sides have established a Joint Cooperation Committee with working groups focused on four main areas: the Gwadar Port, transport infrastructure, energy, and industrial cooperation. Operations at Gwadar, a warm-water, deep-sea port in Balochistan near the Strait of Hormuz, were handed over to a Chinese state-owned enterprise in November 2015. Gwadar remains a work in progress, with total traffic of only half a million tons in 2016, but traffic isexpected to double in 2017. Planners estimate that eventually it will process three hundred to four hundred million tons annually and that the surrounding city will grow from eighty thousand to two million residents. While armed conflicts still rage in Syria, Iraq, and other troubled spots of the world, a major conflagration of epic proportions that may involve some of the world’s most powerful sovereign powers, including the United States, China, Japan, and even Russia, is brewing in earnest in the South China Sea. At the center of this conflict is China’s extravagant maritime and territorial claims for almost the entire South China Sea, riling most countries in the region, upsetting key stakeholders along the world’s busiest commercial shipping lanes, and challenging key international maritime laws and interpretative frames of sovereignty and territorial integrity. In China’s long history, unlike in the rest of the world, there has never been a willing acceptance of sovereign equality among nations, big and small. At the core of China’s strategic culture lies a Sino-centrism, which places China at the most pivotal spot of the world with a moral responsibility to rule all under heaven with China’s superior and refined culture and institutions—a political philosophy comprehensively illustrated in a 2010 manifesto called “The Chinese Dream” by a Chinese military writer. “There has never been such a thing in the world as a nation’s peaceful rise,” Senior Colonel Liu Mingfu of the Chinese People’s Liberation Army wrote in the 300-page bestseller in China. “China possesses a superior cultural gene needed to become the world’s leader.” By serendipity or by design, Chinese Supreme Leader Xi Jinping’s overall political platform is also called “the Chinese Dream.” China therefore is not simply a country of consequence, but a civilizational block that serves to inspire the world to be more like China and accept China’s way of governance. In fact, China’s unshakable sense of victimhood and humiliation, vigorously promoted by the Chinese government for decades, is as much about China’s suffering since the Opium War of the 1840s at the hands of Western imperialists, as about the resentment and loathing toward the idea that the magnificent Celestial Kingdom has been bullied by far less sophisticated, morally inferior little countries with little or no refined cultural heritage and intellectual splendor. Translated into the South China Sea gambit, China’s aggressive behavior and excessive maritime claims can boil down to simply a matter of correcting the pattern of the Big Country not being respected by these pesky Little Countries around the South China Sea, especially the Philippines and Vietnam, the two countries that resist the Big Country the most. One doesn’t even have to resort to conjectures to find the prevalent utterances by China’s top officials about how daguo (Big Country) should not be resisted by xiaoguo (Little Countries). Since March 2013, Supreme Leader Xi Jinping has been espousing the core of his foreign policy, neatly called “Big Country Diplomacy.” Former PLA Navy chief Liu Huaqing repeatedly told his American counterparts in the 1990s that his problem was not China, as the Big Country, bullying the Little Countries, but the other way around, i.e., these Little Countries bullying the Big Country. China’s state-run media, most noticeably the jingoist Global Times, have justified China’s bellicosity toward its many neighbors as “punitive” actions to teach the Little Countries lessons and restore their submission to the Big Country. Closely related to Sino-centrism is China’s seasoned approach to conquest by moral persuasion, subjugation by voluntary acknowledgement of China’s supremacy, an element of the Chinese strategic culture known as wangdao, or the Way of the Kings. Under this scheme, blunt force will be used only if/when Little Countries do not accept China’s wangdao and refuse to kowtow to the magnanimous and benevolent China. If they choose to continue resisting China’s generous offer of lordship and suzerainty, then China feels justly snubbed. What does the Department of Defense really think about China's military? Friday’s Department of Defense (DoD) report to Congress on Chinese military and security developments is the last issued under the Obama Administration. Amid geopolitical uncertainty, it was a respectable final contribution. Nevertheless, it suffers from an unfortunate shortcoming. The Pentagon report rightly highlighted growing concern about Beijing’s mounting maritime coercion, but passed up a rare chance to connect it with a potent player flouting the rules of the game. China’s Maritime Militia, the irregular frontline sea force of “Little Blue Men” trolling for territorial claims, receives nary a mention. Like a trident with only one full-fledged prong, a report covering only one of China’s three major sea forces in depth—and ignoring one entirely—remains regrettably incomplete. A key official thus encapsulated one of the most important, complex security challenges facing his government and a vital region whose peacefulness and openness it underwrites. The problem: his administration’s final iteration of the report offering unparalleled authoritative public insights on Chinese security developments missed a chance to cut to the heart of the problem by addressing China’s Maritime Militia and the concept of People’s War at Sea that inspires its development. None of this should overshadow the report’s many welcome contributions. At a hefty 145 pages, it is highly informative and will repay whatever time you can devote to it. Through detailed text, maps, and figures, it documents a rapidly developing Chinese military, commanded by leaders inspired by ambitious national goals, in the throes of the most sweeping reforms in three decades or more. In doing so, it outlines broad dimensions of strategy, organization, leadership, and events that are largely available in open source scholarship—sometimes richer, more nuanced, and more comprehensive—but rarely in one place and almost never with a leading government’s analytical seal of approval. Those seeking a reasonable overview of Chinese military efforts need look no further than paragraph one. “Chinese leaders have characterized modernization of the People’s Liberation Army (PLA) as essential to achieving great power status and what Chinese President Xi Jinping calls the ‘China Dream’ of national rejuvenation. They portray a strong military as critical to advancing Chinese interests, preventing other countries from taking steps that would damage those interests, and ensuring that China can defend itself and its sovereignty claims.” Thus motivated, “The long-term, comprehensive modernization of the armed forces of the People’s Republic of China (PRC) entered a new phase in 2015 as China unveiled sweeping organizational reforms to overhaul the entire military structure. These reforms aim to strengthen the Chinese Communist Party’s (CCP) control over the military, enhance the PLA’s ability to conduct joint operations, and improve its ability to fight short-duration, high-intensity regional conflicts at greater distances from the Chinese mainland.” Beijing continues to put its money where its mouth is, with China’s defense budget indisputably the world’s second largest. While acknowledging the challenges inherent in such a calculation, the Pentagon estimates Beijing’s total military-related spending in 2015 at over $180 billion. Exercises of increasing scale, jointness, complexity, and realism are part of an effort to make China’s military far more than the sum of its unevenly growing parts. Iraq has just seen one of its most horrifying days of terrorism in what is now some thirteen years of war. ISIS has struck at Iraq’s civilian population with the clear goal of dividing the country between Sunni and Shi’ite—although one of its three bombs did kill Sunnis as well. The end result is at least 93 dead and hundreds of wounded—all innocent civilians. To some extent, this reflects progress in the fighting. ISIS has lost a substantial amount of the territory it once controlled. While Iraq is anything but unified, it also has not seen the kind of divisions between Arab Sunni and Arab Shi’ite, or Arab and Kurd, that keep Iraqi forces from advancing in the west and gradually moving towards the liberation of Mosul. Using mass terrorist attacks against civilians to inflame the sectarian and ethnic fault lines in Iraq makes all too much sense from the perspective of ISIS—as do any such attacks that can provoke a response from Shi’ite militias against Iraq’s Sunnis, or divide its Arab and Kurds. Moreover, repeatedly using terrorism to strike at civilian targets outside ISIS’s area of control is an effort to discredit the Iraqi government and create public demands to shift Iraqi security forces away from a focus on liberating Mosul and western Iraq to protecting the population. ISIS is attempting to distract attention from their own losses, to attract volunteers or funding, and to warn those in the areas it occupies just how ruthless ISIS can be if they oppose it. There is nothing irrational about ISIS’s actions from its ideological perspective and values. They have a solid strategic rationale. There is no doubt that the Iraqi government, militia, and tribal forces—as well as Syrian Kurdish and Arab rebel forces—have made gains against ISIS. Maps and claims differ, and official U.S. statements often make absurd claims about liberating large areas of empty desert. In broad terms, however, the most recent map on the Department of Defense website—which is shown in Figure One below—does reflect legitimate gains. In fact, the map understates the gains made since February, which include a major ISIS defeat and its loss of Palmyra. This is shown in Figure Two, which displays a BBC map of areas of ISIS control in Iraq and Syria as of April 26, 2016—some two months later. This map draws upon the consistently excellent work of the Institute for the Study of War, as well as USCENTCOM, and also highlights the impact of the U.S-led air campaign and the real world difference between ISIS control of populated areas and its freedom to operate in largely unpopulated desert. The problems the United States and its allies face, however, do not lend themselves to anything approaching as simplistic an approach to strategy as the one chosen by ISIS. These are issues that James Clapper, the U.S. Director of National Intelligence, raised in part in his May 10 interview with David Ignatius in the Washington Post, and where the Obama Administration needs to provide a far clearer picture of both its strategy and actions than it has provided to date. This statement seems to have come as a surprise to some commentators, but it should have been all too obvious a reality. The Obama Administration did not act decisively at the points in the conflict when it might have prevented a long war of attrition, and its real world “strategy” in both Syria and Iraq has been one of slowly escalating U.S. involvement in what amounts to creeping incrementalism. It has been far too slow to provide an adequate train and assist mission to rebuild the half-finished Iraqi Army that Iraq’s former Prime Minister—Maliki—effectively corrupted and destroyed in his search for power and control after U.S. forces left at the end of 2011. Above you can see a map of the world from Russia’s point of view. Sometimes the most powerful graphics are not those with special effects or provocative statistics, but those that change your perspective. This is one such map. The days of the Soviet Union are over and are not about to return. The U.S. is the world’s most powerful country, and unlike in the Cold War, it has no peer. Russia, however, is still a formidable regional power, making headlines in recent years for its military actions in Georgia, Ukraine and Syria. Much of the coverage you’ll read about Russia centers on President Vladimir Putin – his skill as a leader and the extent to which many Russians love and admire their leader and their country. But more important than Putin’s attributes is to understand how any Russian leader must view the world. Look carefully at this map and all of Russia’s major strategic issues become immediately apparent. Russia’s core is west of the Ural Mountains, and Russia’s biggest cities – Moscow and St. Petersburg – are closer to Europe than anywhere else. 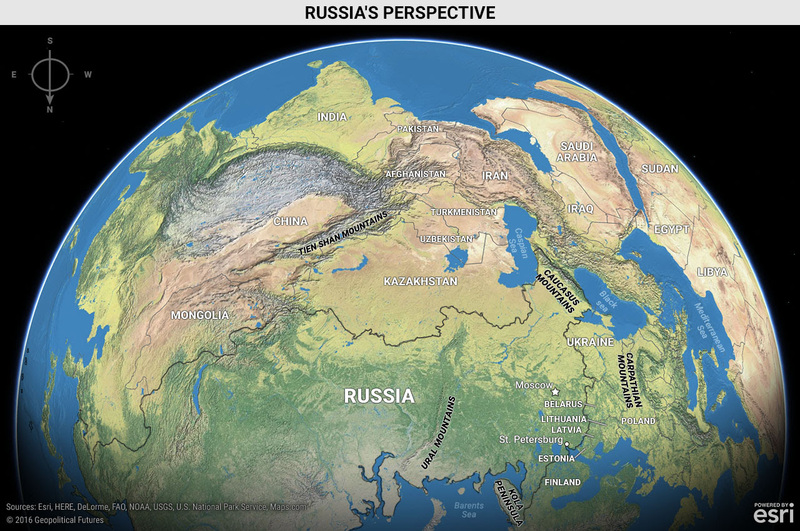 Russia is a vast country, and the majority of its land is in Asia, but deserts and mountains separate Russia from China, India and much of South Asia. Russia’s orientation is first and foremost toward Europe, and second toward the Caucasus and Central Asia. In almost all cardinal directions, Russia has strategic geographic features that naturally define the scope of its power – and to the west, unlike during the days of the Soviet Union, Russian power no longer extends to its natural buffer zones in the Carpathians and Eastern Europe. Russia’s major cities lie along the North European Plain, the invasion superhighway of Europe, and without strategic depth, Russia is vulnerable to would-be challengers stationed in Eastern Europe. Russia is a land-based power, so the importance of the Black Sea – Russia’s only access to the Mediterranean – becomes clear. So too does the inevitability of conflict with Turkey, which is the gatekeeper of the Bosporus and therefore controls that access. In his 1961 farewell address, President Dwight D. Eisenhower warned of the growing influence of the “military-industrial complex” on American politics and policy. Interestingly, Eisenhower’s original formulation of the menace was the even more accurate “military-industrial-congressional complex.” (Emphasis added). Seeing how that network of special interests has worked its tentacles into so many aspects of American political and economic life in the intervening decades indicates just how prescient was Eisenhower’s warning. But there has been an even more subtle and pervasive militarization of American culture. It has been evident since World War II, but it has been accelerating markedly in recent years. Perhaps the most corrosive domestic effect of the global interventionist foreign policy that Washington adopted after World War II has been on national attitudes. Americans have come to accept intrusions in the name of “national security” that they would have strongly resisted in previous decades. The various provisions of the Patriot Act and the surveillance regime and its abuses epitomized by the NSA are a case in point. The trend toward a more intrusive, militaristic state has become decidedly more pronounced since the September 11 attacks and the government’s response, but there were unmistakable signs even before that terrible day. My colleagues at the Cato Institute have done an excellent job documenting the gradual militarization of America’s police forces, beginning in the 1980s, with the proliferation of SWAT teams and the equipping of police units with ever more lethal military hardware.The terrorism threat simply provides the latest, most convenient justification to intensify a trend that was already well underway. Most SWAT raids in fact have nothing to do with terrorism; they are used to serve search or arrest warrants in low-level drug cases. Politicians learned early that the fastest way to overcome opposition to a pet initiative was to portray it as essential to national security. Thus, the statute that first involved the federal government in elementary and secondary education in the 1950s was fashioned the National Defense Education Act. Similarly, the legislation establishing the interstate highway system was officially the National Defense Highway Act. In retrospect, President George W. Bush probably missed an opportunity when he did not label his legislation for a Medicare prescription drug benefit the National Defense Elderly Care Act. And then there is the overall militarization of language. The rise of America’s imperial era coincides with the popular use of the “war” metaphor. In recent decades, we’ve had “wars” on everything from cancer to poverty to illiteracy to obesity. And, of course, we still have the ever present war on illegal drugs that Richard Nixon declared more than four decades ago. Language matters, and the fondness for such rhetoric is a revealing and disturbing indicator of just how deeply the garrison state mentality has become embedded in American culture. Yet another sign is the growing tendency to misapply the term “commander-in-chief.” The Constitution makes it clear that the president is commander-in-chiefof the armed forces. There were two reasons for that provision. One was to assure undisputed civilian control of the military. The other was to prevent congressional interference with the chain of command. Pakistan’s Advisor on Foreign Affairs Sartaj Aziz achieved a rare feat on Thursday when in three crisp sentences he summed up the complicated relationship between his country and the United States. Our relations with the United States constitute an important element of our foreign, defense and economic policies. This seven-decade of relationship, while robust and wide ranging, is characterized with occasional vicissitudes. Despite its inherent challenges, both sides have managed to keep a pragmatic, working relationship over the course of years. Aziz was unemotional, and would not give centrality to the ties with the US. He never once described the relationship with the US to be ‘strategic’. In sum, F-16 aircraft meet a critical need, and Pakistan is negotiating hard, but won’t go down on its knees. Yet, US-Pakistan ties remain “robust and wide ranging” and have withstood ups and downs. There are inherent challenges, but Islamabad and Washington have managed to keep it going as a “pragmatic working relationship”. Aziz did not claim this was a “vital relationship” or that the two countries have “shared threats and concerns, shared interest in the region” – expressions used by the US state department spokesman while viewing the panorama from Washington last week. He took strong exception to the recent moves by the US Congress to stop the Obama administration from using foreign military financing to subsidize to the tune of US$429 million to finance the sale of eight F-16 aircraft to Pakistan, and, secondly, to block $450 million of military aid to Pakistan for failing to take action against the Haqqani Network in Afghanistan. Aziz made a subtle distinction between the US Congress and the Administration and put the finger on the Indian lobbying on the Hill, but he also reminded the Obama administration that it recently had concluded “wide ranging defense deals” with India, which impact the strategic stability in South Asia. A complex diplomatic pirouette is playing out. The US Congress pretends to act independently and the Administration pleads helplessness. But the Administration also robustly promotes military cooperation with India on a parallel track. Even though U.S. State department has been consistently underlining the importance of good relations with Pakistan, there are broader geo-political issues which must be kept in view. Pakistan closely monitors the burgeoning strategic partnership between the US and India. The US is fueling the Sinophobia in the Indian mind by alleging that China and Pakistan are cooperating to block India’s membership of the Nuclear Supply Group and other technology control regimes and that China is undertaking a military build-up on the border with India. President Barack Obama has invited Prime Minister Narendra Modi to pay a state visit to the US in June. On the whole, Washington is making a determined pitch to get India on board its rebalance in Asia while India shows reluctance. The Ganges is one of the greatest rivers on Earth, but it is dying. From the icy Himalayan peaks, where it begins, right down to the Bay of Bengal, it is being slowly poisoned. The Ganges is revered in India but it is also the sewer that carries away the waste from the 450 million people who live in its catchment area. Pollution from the factories and farms of the fastest-growing large economy in the world – and from the riverside cremation of Hindu true believers - has turned its waters toxic. The Indian Prime Minister, Narendra Modi, promised two years ago to clean up the Ganges, but can he do it? Can the sacred mother of Hinduism be saved? WASHINGTON, May 13, 2016 — China’s investments in military and weaponry operations continue on a path to increase its power projection, anti-access and area denial and operations in cyberspace, space and electromagnetic emerging domains, the deputy assistant secretary of defense for East Asia told Pentagon reporters today. Abraham M. Denmark described the Defense Department’s annual report on military and security developments involving China, released to Congress today. Highlighting China’s defense strategy and military developments, Denmark said the report provides factual, descriptive and analytical information to Capitol Hill. “It lets the facts speak for themselves,” he said. China’s leaders seem committed to sustaining defense spending growth for the foreseeable future, despite its economic growth deceleration, he said. “From 2006 to 2015, China’s officially disclosed military budget grew at an average of 9.8 percent per year in inflation-adjusted terms,” Denmark said, noting that its published military budget left out numerous major spending categories, such as research and development and procuring foreign weapons and equipment. “The true expenditure, DoD estimates, in terms of total military-related spending for 2015, exceeded $180 billion in 2015,” he added. Such investments are resulting in strides such as China’s recently unveiled DF-26 missile, a system capable of precision ground strikes in the Asia-Pacific region, he said. Besides China’s ongoing, long-term military trends, its military modernization program entered a new phase in 2015 comprising three key security developments, Denmark said. The first trend is China’s maritime activities, in which it used assertive tactics to reclaim existing outposts and began building military facilities on large swaths of land in the South China Sea in 2015, he said. The second trend is China's growing global military presence, he said. “China's leaders are leveraging the country's power to expand its international influence -- and its military footprint overseas,” Denmark said. The biggest example of expanding ambitions, he emphasized, was China’s announcement in November that it would stand up a military facility in Djibouti. “This is a big step forward for the PLA, which has never had an overseas facility before,” he noted. The third security trend is China’s large-scale reforms to make the its military more capable and politically loyal, Denmark said. “President Xi Jinping unveiled sweeping plans that are intended to enhance the PLA's ability to conduct joint operations, by replacing the old military regions with new geographic commands,” he pointed out. The plans also seek to strengthen the Chinese Communist Party's control over the PLA by establishing new bodies to oversee the military, Denmark added. Fifty years ago, on May 16, Mao Zedong unleashed an attack aimed at smashing his own Communist Party apparatus from top to bottom, having concluded that it was going capitalist. “Bombard the headquarters!” he urged the masses in a famous People’s Daily article. Millions of young zealots responded, becoming Mao’s Red Guards, his fanatical foot-soldiers. Thus began China’s Great Proletarian Cultural Revolution, a period of murderous insanity that ended only with Mao’s death a decade later, in 1976. Nothing could be further from the tactics of President Xi Jinpingtoday as he seeks to rid the party of the ills that he fears could lead to its extinction—corruption, moral decay, the loss of will to fight for a cause. His response has been to impose rigid order from on high, to stifle criticism—party members are forbidden from engaging in “improper discussion”—and to crush organized dissent, no matter how mild. Draconian media censorship has silenced debate on the Internet. Yet, despite these obvious differences, Mr. Xi has spent his first three years in office resurrecting Mao, borrowing his rhetoric and aping his practices. He has concentrated power in his own hands and flirted with a personality cult—the most haunting symbol of the Cultural Revolution, in which blind worship of a supreme leader kindled years of convulsive violence. As many as 1.5 million Chinese were beaten to death, driven to suicide or killed in fighting among Red Guard factions. 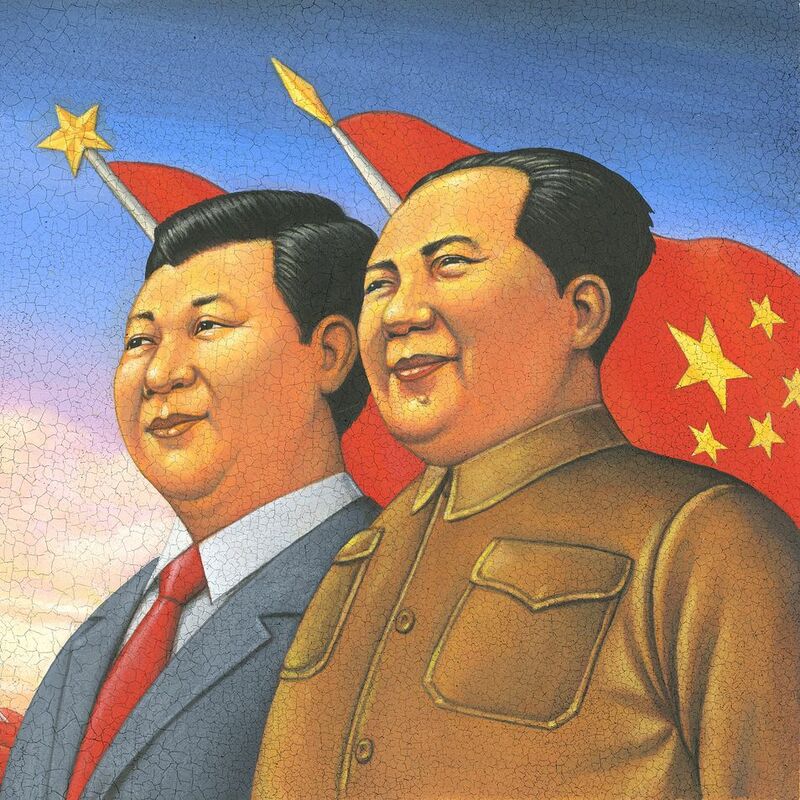 But the paradox of Mao’s continuing influence remains: Contrary to expectations, a half-century after the Cultural Revolution began, the “Great Helmsman,” as he styled himself, is again the most potent force in the country’s political life. What part of his legacy, exactly, is Mr. Xi claiming? Will the U.S. Draw the Right Lessons From Today’s Middle East Conflicts? There has been a distinct pattern to America’s time as a global power: Whenever the United States becomes involved in a conflict, it quickly draws lessons that set the trajectory for the next conflict or problem. American strategy truly is iterative, with the recent past paving the way for future action. This means that getting the lessons right, or at least as right as possible, is a vital part of strategy-making. Throughout the 1970s and 1980s, for instance, the lessons of Vietnam haunted policymakers and framed public debate over America’s role in the world. This led the U.S. military to reject counterinsurgency and focus on preparing for short, morally unambiguous conventional wars against aggressor nations. The 1991 war with Iraq validated this approach. Then involvement in the Balkans taught American policymakers that allies still needed active U.S. involvement to deal with major security problems, and that a U.S. military optimized for short, conventional wars could adapt to missions like peacekeeping if ordered to do so. An important lesson was that the armed forces did not need special units for what was then called “operations other than war”—regular combat formations could figure out how to do it. After the 9/11 terrorist attacks, America’s conflict with transnational Islamic extremism soon produced new, preliminary lessons. One was that destroying autocratic regimes in the Islamic world—the Taliban in Afghanistan, Saddam Hussein in Iraq, Moammar Gadhafi in Libya—without building stable and functioning states afterward may be worse than tolerating them, since it gives extremists operating space. A result of this has been the Obama administration’s hesitance to push out Syrian dictator Bashar al-Assad. Another lesson of the conflict with Islamic extremism has been that the United States is bad at building stable and functioning states in cultures it does not understand, and no other nation or international organization is going to step up and do it for the United States. The Bush administration’s belief in 2003 that the United Nations or Arab peacekeepers were going to put Iraq back together now seems tragically naive. A third lesson is that today’s extremists have what national security experts call a “power-projection capability”: the ability to undertake or inspire international terrorism. Today, though, these lessons remain preliminary. Americans quickly reach a working consensus on outcomes seen as successful, like the 1991 war with Iraq or the intervention in the Balkans, but drawing lessons from failure takes longer and is more contentious. Thus it is not clear what the ultimate lessons of the ongoing conflict with transnational Islamic extremism will be. People become radicalized when they lack hope, jobs, and purpose. Local investments can break the cycle. For all the lip service given to breaking the cycle of radicalization where it starts—at the local level—the global leaders on the topic have done almost nothing to empower such action. We know enough about recruitment for ISIS and its ilk to know that there is no single way individuals radicalize. We also know it involves some combination of ideological, psychological, and community-based factors. People flocking to Syria to join terrorist groups tend to be radical before they are religious, and tend to be motivated more by seeking personal agency than by any lofty ideology. Our work involves looking at these local community factors through the eyes of community members, using data to map the lifecycle of recruitment to violence, looking at the root causes among community factors. China’s decades-long military modernization “entered a new phase” last year under the aggressive leadership of President Xi Jinping, a new Pentagon report on Beijing’s military capabilities said today. The “sweeping transformation” includes making the formerly mass army a nimbler, more balanced force that is acquiring the kind of expeditionary capabilities the U.S. military already enjoys. “China’s military modernization is producing capabilities that have the potential to reduce core U.S. military technological advantages” on the sea and in the air, the report found. The most visible outward sign of China’s military muscle-flexing can be seen in the 3,200 acres it has reclaimed on reefs and rocks in the South China Sea. Three of those sites in the Spratly Islands now have port facilities and 10,000-foot runways that can handle any plane in the Chinese arsenal, the report found. Those territorial claims, which clash with rival claims from other states in the region, are backed up with coast guard and civilian ships. “It seems to us that these activities are designed to stay below the threshold of conflict,” but demonstrate that China is willing to defend its territorial claims, Deputy Assistant Secretary of Defense for East Asia Abraham Denmark said while unveiling the report at the Pentagon. Every year, Estonia holds special military exercises called Spring Storm. The exercises are for those conscript soldiers who have just completed their term of service. This is their graduation event. But since Russia invaded parts of Ukraine in 2014, Spring Storm has taken on a much more important significance. The exercises are now about projecting a show of strength and confidence, with an increasing participation of NATO and non-NATO allies. If anything, the Ukraine crisis has been a catalyst for NATO and non-NATO countries to work far more closely together and improve interoperability. Going it alone on security issues is not an option. The Spring Storm exercises began on May 2 and will last until May 19. They include several leading NATO countries. The Baltic states, Poland, Canada, the Netherlands, Britain, and the United States are providing equipment, F-15 fighters, and other military aircraft. Non-NATO Finland and Sweden are participating too. Over 6,000 troops are on the ground. On paper, it all seems very impressive. But NATO officials told Carnegie Europe that such exercises could not deter Russia in the event of an attack. “The reality is that we have gaps in several areas of our capabilities,” an official said in an interview, speaking on condition of anonymity. “The Eastern allies are all looking toward Warsaw for more concrete steps to be agreed to boost the region’s security,” he added, referring to the NATO summit to be held in the Polish capital in July 2016. At its last summit in Wales in September 2014, NATO leaders agreed on a host of reassurance measures to boost the security of its Eastern flank. The Readiness Action Planis supposed to make the alliance capable of responding swiftly and firmly to new security challenges. Since then, NATO has been conducting numerous exercises in the region. Russia has responded, and not only with harsh rhetoric. The Russian exclave of Kaliningrad, which is sandwiched between Poland and Lithuania, has become increasingly militarized. Russia’s use of Kaliningrad is clearly intended to intimidate the Baltic states. According to the Eurasia Daily Monitor, quoting a Russian military expert,Russian forces could establish effective control over Estonia, Latvia, and Lithuania within two to three days. NATO would be unable to react in time. Russian saber rattling or not, NATO’s allies feel vulnerable. While showing off some new UAZ Patriot pickup trucks armed with machine guns and grenade launchers to Russian President Vladimir Putin on Thursday, a general couldn't open the door of one of the trucks and, in his desperate desire to please the commander-in-chief, ripped off the door handle. "Well done," Putin said, laughing. Meanwhile, the North Atlantic Treaty Organization is debating how most effectively to deter Russia from invading the Baltic States. The U.S. has already proposed quadrupling the budget of the so-called European Reassurance Initiative, to $3.4 billion in 2017. A billion dollars of that sum is to add another armored brigade combat team, 4,000 to 5,000 strong, to the 35,000 U.S. troops already present in Europe. Another $1.9 billion is earmarked for additional war-fighting equipment. Still, many U.S. analysts still believe that may not be enough for deterrence. They should watch the door handle video and ask themselves if they aren't being hoodwinked. RAND Corporation recently held a war game to see if the Baltic states were defensible against Russia and concluded that, with the current level of protection, the Russian military could get to Tallinn and Riga in as little as 60 hours. To prevent such an outcome, Rand concluded that NATO would need seven brigades, including three with heavy armor, "adequately supported by air power, land-based fires, and other enablers on the ground and ready to fight at the onset of hostilities." Writing for the Atlantic Council, Franklin Cramer and Bantz Craddock proposed reinforcing the Baltic nations' defenses with additional air defense and anti-armor systems and setting up new multinational battalions former from Baltic, other European and U.S. soldiers. On the defense analysis site War on the Rocks, Elbridge Colby and Jonathan Solomon declared the planned additional U.S. deployment insufficient, arguing that persuading the "increasingly capable Russians" to stand down would require "fielding a conventional military posture that includes substantial, potent forces permanently deployed forward in Central and Eastern Europe that can assuredly arrest any Russian military thrust into NATO member-state territory." These experts all discuss Russia's resurgent military strength. RAND argues that forces in Russia's Western Military District are far more powerful, in terms of numerical strength and equipment, than what NATO deploys in and around the Baltics. Russia's air campaign in Syria has also impressed many. Watching the door handle video or reading last year's reports from Debaltsevo in eastern Ukraine, where local rebels aided by Russian troops encircled and defeated the Ukrainian army after weeks of heavy fighting, should sow some doubts in the minds of military specialists as to the Russian army's readiness for a bold invasion of two or three NATO member states. Although Russia is undergoing extensive rearmament, a program to which Putin pays lots of attention, it's plagued by typical modern Russian problems of inefficient, overly expensive procurement and shoddy quality. Demonstrating success to Putin is more important to the generals than actually achieving it and Putin, in turn, may well be more interested in showing off to the world in Victory Day parades on Red Square, than attacking NATO. He pursues domestic goals, too, whipping up a patriotic frenzy to maintain his support. The climate in today's Russia is one in which Kalashnikov, the assault rifle manufacturer, is having difficulty turning a profit from its main product -- but is hoping to make up for that by producing a line of military style clothing for patriots. Russian troops can be effective against weak adversaries, such as the Ukrainian military or lightly armed Syrian rebels, but even then they do not achieve lightning-fast results. The invasion of Crimea was scary, because unbadged Russian soldiers there wore modern-looking gear and looked dangerous, but they did not meet with any resistance. As the Wilson Center's Michael Kofman argues on War on the Rocks, "the Russian army is simply not set up to occupy an invaded country, particularly one likely to resist. There are few permanent units based on NATO’s borders and no higher tier command structures to organize a fight using units pieced together from other districts." A cheap way to avoid costly strategic mistakes. It’s a great time to be a Pentagon game nerd. Long dismissed as the geekier side of the military, war gaming is suddenly in demand, after the Department of Defense realized that if it wants to devise a strategy to beat China and Russia, it needs to play games. Last year, Deputy Secretary of Defense Robert Work issued a startling directivedemanding the military conduct more wargaming. Work’s eye is on an important prize: a new “offset strategy” for the twenty-first century. The First Offset Strategy, in the 1950s, relied on nuclear weapons to stop massive Soviet ground forces, while the second strategy of the 1970s emphasized smart weapons to stop the Red Army. Now the focus is on a Third Offset Strategy to discover technologies and tactics to neutralize an imposing spectrum of new threats, such as ship-killing hypersonic missiles, cyberwarfare and terrorism (for my deeper analysis of the Pentagon directive, go here). Yet in an era when a single jet costs more than a $100 million dollars, and a new aircraft carrier costs $13 billion, mistakes aren’t cheap. Like all nations in history, the United States must guess what the next war will be like and plan its force structure accordingly. And that’s where war gaming comes in. Games can’t predict the future like a crystal ball. Don’t believe anyone who says they can. But games can offer insights and guidance on what weapons to buy and how to use them. To be clear, we are not talking flesh-and-blood soldiers engaging in mock combat at Fort Polk, or video games that teach troops basic skills, or even computer models that calculate the lethality of a new missile. What the Pentagon wants is analytical war games to explore how conflicts might be waged, what weapons an adversary might unleash and what technology the United States needs. Despite the popular image of sophisticated supercomputers in movies like 1983’s WarGames, analytical war games are often a BOGSAT (bunch of guys sitting around a table) simulation where people pretend to be the Russian government or the Chinese Navy or whatever the scenario demands. The designers of these games tend to be the sort of people who think it wonderful to spend a gorgeous summer afternoon in a dark basement, playing a board game as they refight Waterloo or Jutland. War games and the military go back a long way. Chess was invented in India almost two thousand years ago as a game of military strategy, and the Germans used Kriegsspiel to train their elite General Staff officers. More relevant to the current U.S. strategic dilemma is how the U.S. Naval War College used wargames in the 1930s—including model ships maneuvered on the floor—to develop the war plans that eventually defeated Japan in 1945. Yet as Work said in his directive, “I am concerned that the Department’s ability to test concepts, capabilities, and plans using simulation and other techniques—otherwise known as wargaming—has atrophied.” To fix the problem, the Department of Defense has requested $55 million for war gaming in fiscal year 2017, which is still a drop in the bucket compared to the nearly $600 billion the Pentagon spends now. There is a duel going on in Turkey’s southern province of Kilis. Since the beginning of the year, forces of the Islamic State in Iraq and the Levant (ISIL) have fired katyusha rockets into Kilis. The Turkish Armed Forces (Türk Silahlı Kuvvetleri, TSK) have responded with artillery fire and airstrikes, reportedly killing at least 862 ISIL fighters this year. Still, rockets have landed in Kilis every day in May. According to a combination of data from Metin Gurcan and Aaron Stein, as of May 8, 21 people have been killed and at least 88 wounded on the Turkish side of the border this year. There is growing anger at the local and national government over the disruption to daily life. Simultaneously, ISIL released a statement that it will soon show the consequences for Turkish state actions in a video featuring a TSK soldier captured in July 2015. Both sides appear to be escalating their reactions, culminating on the night of May 8, with the Turkish military for the first time announcing it had conducted a ground incursion into Syria. According to the pro-government daily Yeni Şafak, 15 to 20 Turkish special forces units entered ISIL-controlled territory to target rocket launchers. The raid was followed by airstrikes from coalition forces and with the knowledge of the United States and Russia. Why is ISIL picking a fight with Turkey? Does ISIL see its actions as a response to Turkish fire support to opposition forces fighting in northern Aleppo? Or are they a deliberate attempt to force an already strained Turkish military into a more involved and bloodier intervention in Syria? ISIL’s most recent propaganda directed at a Turkish audience may provide a clue to its strategic goals toward Turkey. A “cyberbomb” is not a single weapon. Rather, cyberweapons are collections of computer hardware and software, with the knowledge of their potential uses against online threats. Although frequently used against Internet targets such as websites and forums, these tools can have real-world effects, too. Cyberattacks have disrupted cellphone networksand tricked computers controlling nuclear centrifuges into functioning differently from how they report their status to human operators. A simulated attack has shown how an enemy can remotely disrupt electric power generators. Within a few months of taking office in 2009, Barack Obama made two trips – and speeches – that raised the world’s already giddy expectations that his would be a transformational presidency, one that would positively change the world and America’s place in it. In Cairo, in June, the new President, noting that his own “father came from a Kenyan family that [included] generations of Muslims,” called for a “new beginning” between the United States and the Islamic world. If any U.S. leader could achieve this, it seemed it was him. In Prague, two months earlier, Mr. Obama had made an even bolder undertaking. He promised to devote his presidency to ridding the world of nuclear weapons. “To put an end to Cold War thinking, we will reduce the role of nuclear weapons in our national security strategy, and urge others to do the same,” he vowed. He would set an example, he insisted, to reassure other fast-arming nuclear powers that the proliferation of nuclear weapons need not be inevitable. If Mr. Obama’s new beginning with Muslims became collateral damage amid his widely panned reactions to the Arab Spring, the war in Syria and the rise of the Islamic State, what can be said of his nuclear non-proliferation agenda? Editor’s Note: This is the next installment in our special series, “The American Exception,” which was kicked off by David McCormick last month. If you’re interested in contributing to this series, please read our submissions guidance. The United States of America is exceptional because it has done exceptional things, not because of boasts. Historically, exceptionalism — a belief that because of what America represents, its actions are just and benign — offered good intentions i.e. by supporting the spread of democracy and human rights. America’s brand of exceptionalism has, however, also led the United States into tragedies from Vietnam to Iraq. What lessons might be learned? This ball of liberty, I believe most piously, is now so well in motion that it will roll around the globe, at least the enlightened part of it, for light and liberty go together.